Zach grew up in Chapel Hill, NC, where he also went to college. During his childhood, church was optional and Jesus was a footnote. Nonetheless, he grew up happy, with loving parents. God came for Zach when he was 16 and started reading the Bible. Jesus leapt off the page as the wisest, most loving, and just person Zach had ever encountered. Zach’s enthusiasm for Jesus has never waned. If you ask him a question about anything remotely related to Jesus, come prepared with a comfortable seat and a snack. Zach met his wife Vanessa at summer camp in the mountains of North Carolina. They married immediately after college. They have four children: Haley, 8; Liam, 6; Lucy, 4; and Claire, 2. 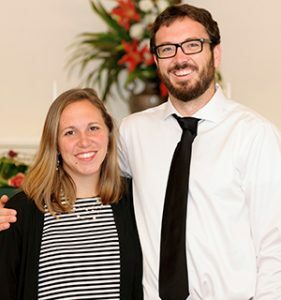 They spent the first eight years of their married lives as members of Valley Hope Church in the NC mountains, where they learned to love Jesus’ bride in all of her flawed beauty, and grew together as God worked in their lives. They moved to Corvallis in 2015 to serve at Calvin, and have enjoyed it immensely. 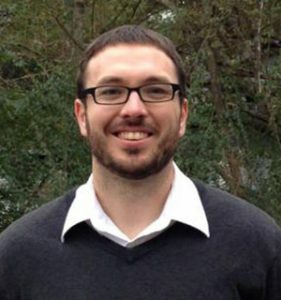 When he is not pastoring, changing diapers, reading stories, or wrestling with his kids, Zach enjoys reading, basketball, ultimate frisbee, hiking, amateur home improvement, and pretty much anything he gets to do with Vanessa (he will even consent to a trip to Target if it means getting a date night). Andy grew up in Tucson, Arizona, and attended college at Northern Arizona University in the beautiful mountain town of Flagstaff. 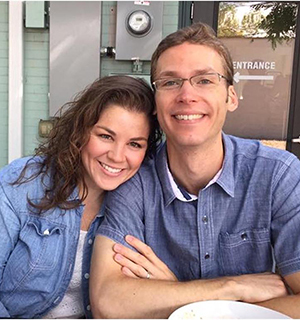 During his time at NAU he came to know Jesus through the ministry of InterVarsity, and his life has never been the same since. After college he bounced around a few odd jobs before yielding to God’s call to go to seminary. Andy moved to Denver, Colorado, in 2012 to attend Denver Seminary, and shortly thereafter met an incredible young woman named Lauren. They were married the summer of 2014, and enjoy hiking, biking, and any excuse to string up their hammock in a park and read together. Andy graduated from Denver Seminary in 2016 with a Master of Divinity, and they moved to Corvallis in 2017 so Andy could serve as the Pastoral Resident at Calvin. While he misses hiking fourteeners, he is thrilled to be a part of what God is doing in and through the Calvin family. Soli Deo Gloria! Vanessa grew up in Atlanta, Georgia, and enjoyed opportunities to play music, go to the theater often, play a variety of sports, and attend a Christian summer camp each year. She met Jesus at camp and saw how his followers carried a hope and joy that set them apart. In college at Ole Miss she attended RUF, a Presbyterian college ministry, became a Young Life leader, and had her first real job as a trip leader for Ole Miss Outdoors. The highlight of college was meeting and planning a life with Zach. Sarah and her family moved to Corvallis in 2005 and began attending Calvin in 2006 after her son was invited to the youth group by a high school classmate. After many years as a stay-at-home mom and part-time editor, Sarah joined the Calvin staff in October 2011. She says, “It is a blessing to use my writing and organizational skills to manage the church office and building usage. I have enjoyed getting to know members and staff better and supporting the many ongoing ministries of the church.” Sarah has been married to Byron for 30+ years; they have three adult children.